The Student of the Game, our pro football podcast, passed 100 subscibers today. This may be a small milestone for most bloggers or podasters, but you have to remember, we live in Orlando, people! Nobody in this town uses RSS, subscribes to podcasts or otherwise does anything "Web 2.0" worthy! 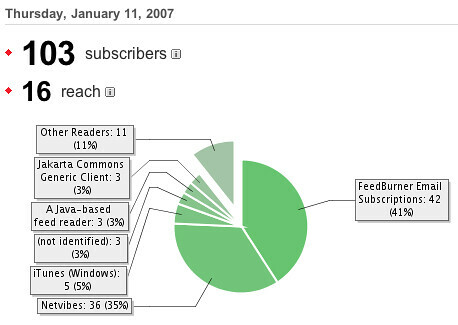 Notice how 40% of these subscribers are via Feedburner Email, and 5 (total) are from iTunes. Also notice that stupid Google only counts as a single hit, so we have no way of knowing if we actually passed 100 a week ago! Damn it to hell! Still, props to Feedburner for making a kickass stats package that lets me see this kind of stuff. How many subscribers do you have, and how many of them are using technology that was invented in the 1970's (email)?